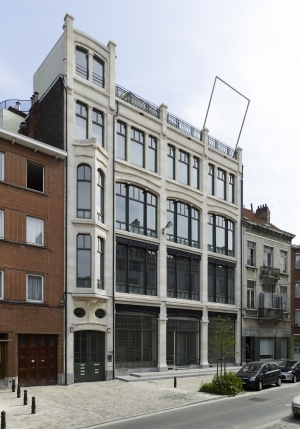 Over the past 30 years, Galerie Greta Meert established itself as one of Brussels’ leading contemporary art galleries. Founded in 1988 as Galerie Meert Rihoux, it was subsequently renamed after its founding director Greta Meert in 2006. Located in the center of Brussels, the gallery occupies a five-story Art Nouveau building designed by Louis Bral and renovated for the gallery by renowned Belgian architects Hilde Daem and Paul Robbrecht. Since 2012 three floors of the building are dedicated to exhibitions, making it possible to maintain an expanded exhibition schedule. In 1988, Galerie Greta Meert opened with Thomas Struth’s first international showing followed by exhibitions with Robert Mangold, Richard Tuttle, Louise Lawler, John Baldessari and Hanne Darboven. In 1992, the gallery presented Isa Genzken’s early sculptures and started to show the work of Donald Judd. These first exhibitions demonstrate the gallery’s aim to bring forth the work of these innovative artists at a time when they were still relatively unknown in Belgium. From the very beginning, one of the main focuses of the gallery has been on Minimal and the Conceptual Art. The significance of photography in conceptual strategies has also been a substantial interest in the programming of the gallery throughout the years. As early as 1991, Galerie Greta Meert was one of the first European galleries to show artists such as Ian Wallace, Jeff Wall and Ken Lum who have collectively been referred to as the Vancouver School. During the 1990s and early 2000 the program was further developed around the work of artists like Carl Andre, Robert Barry, Jef Geys, Peter Joseph, Shirley Jaffe, Sol LeWitt, Jean-Luc Moulène, Fred Sandback, Niele Toroni, Didier Vermeiren and Michael Venezia. Concurrently, the gallery has played an important role in the rediscovery of an older generation of Italian artists who had been eclipsed by the Arte Povera movement. These artists notably include Carla Accardi, Gianfranco Baruchello, Enrico Castellani and Mimmo Jodice. In more recent years the gallery has also become committed to a younger generation of Belgian and international artists whose work builds on the gallery’s distinctive artistic identity and historical standpoint: Eric Baudelaire, Iñaki Bonillas, Johannes Esper, Valerie Krause, Anne Neukamp, Tobias Putrih and Johannes Wald, Edith Dekyndt, Stef Driesen, Sophie Nys, Koen Van den Broek, Catharina van Eetvelde and Pieter Vermeersch.